The thrash resurgence keeps marching on and one of the latest entries are Bay area band Hatchet. As is the standard for this style they dress in black, wearing retro metal type shirts and they sound like it’s about 1987 or so. True to their roots, or at least their area, these guys play the version of speed metal that was popular in the Bay area back in the mid-late 1980s. The influences I hear are early Testament, Exodus and the more obscure Heathen. What defined this style twenty some years ago was the tight chugging type of riffs and Hatchet subscribe to this method of playing as well. Overall, this album has a slight under-produced, even slightly fuzzy sound that quite honestly helps at least a little. In my mind the better thrash was a raw kind of metal so slick production was never the most fitting approach. This band embraces quick pace changes and variation of tones more than the straight pummeling sound that other bands went for. They make it work because they have a manageable grasp on how to manipulate the sounds and the pace. The vocals are fair enough and go along with the music, but sometimes are just ordinary. As with most of today’s younger thrash bands they don’t have a lot of ideas that were not done well before 1990. Like fellow labelmates Fueled by Fire, I think Hatchet manage to display at least some of their passion for this music plus they mix up their influences a little. I can’t swallow this one hook, line and sinker due to a slight lack of originality, yet there is no doubt that Hatchet have created a decent thrash album. 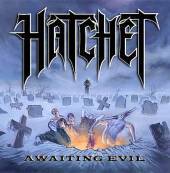 Hatchet: Marcus Kirchen - Vocals; Julz Ramos - Lead Guitar; Sterling Bailey - Rhythm Guitar; Dan Voigt - Bass; Alex Perez - Drum. For more information, check out http://www.myspace.com/hatchet2006.